MODERN “MOUNTAIN” EXPRESS LOCOMOTIVE on the French State Railways, this was an experimental engine of exceptional size on which automatic stoking was installed for the first time in Europe; but 4-8-2 engines are used for express trains on the Paris Cherbourg route, and on other important services. The State Railways of France have some 3,560 locomotives in operation on standard gauge lines. THREE great French trunk railways remain to be described in these pages, namely the State Railways, the Eastern Railway, and the Alsace-Lorraine Railways. The State Railways connect Paris with Havre, Cherbourg, Brest, and the north coast of the Bay of Biscay. The Eastern Railway runs from Paris to the borders of Alsace and Lorraine; it is bounded on one. side by the territory of the Northern Railway of France, and on the other by that of the PLM. The Alsace-Lorraine Railways, known simply as the A-L, continue the routes of the Eastern into these two important territories, which are under separate administration. Few railways in the world can show such a fine record of steady development, modernization, and improvement of services during the past few years as the French State Railways. One of the lines absorbed in the State Railways was the old Western Railway of France, which ran out from Paris into Brittany, and served the principal Channel ports from Dieppe to the west. In 1908, the Western Railway was taken over by the French State Railways, which from 1878 on had been working most of the lines lying between the Western and the Paris-Orleans. This old State system had maintained a secondary service between Paris and Bordeaux by means of running powers over the Western into the capital. For twenty years after their absorption of the Western Railway, the French State Railways developed but slowly. In 1928, however, the clever and energetic M. Raoul Dautry took over the office of General Manager, and the dark days of the French State Railways were over. Within seven years M. Dautry completely reorganized the system, and the “Etat” has now become one of the best railways in Western Europe. The French State Railways are well served in the matter of Paris termini. First and foremost is the great St. Lazare Station, which vies with the rebuilt Eastern Station for the distinction of being the greatest terminus in France. The rail approach consists of a wide cutting, containing one of the finest pieces of track-work outside any passenger terminus. The old Batignolles Tunnel - demolished after 1922 - seems indeed a ghost of the past. St. Lazare Station is used by no fewer than 300,000 passengers daily. From here run the main line to Caen and Cherbourg, over which are operated the American boat expresses, and also the historic Rouen and Havre line, built by the Englishmen Thomas Brassey and Joseph Locke. From Paris to Rouen is a distance of 86.6 miles, the total distance to Havre being 141.5 miles. Until the Dover-Dunkirk train terry comes into operation, the Havre route to England may claim to provide the most comfortable night service between Paris and London, for the steamer gives a good uninterrupted night’s rest, whereas on the shorter route, via Dieppe, train and sea-passage are alike too short to allow sustained sleep. Dieppe is 104½ miles from Paris (St. Lazare) by the direct route through Serqueux and Pontoise. DOUBLE-DECKED COACHES of modern design are used on the Paris suburban services of the French State Railways. The above photograph shows a third-class “smoking” carriage. Railways on the continent of Europe are able to build rolling stock of generous dimensions, because the Continental loading gauge is larger than the British. As explained in the chapter, “Speed Trains of Europe”, which begins on page 875, the State Railways have some fast runs, both with Bugatti rail-cars and with steam-hauled expresses. The fastest rail-car booking is from Havre to Rouen, 54.9 miles, in 45 minutes, at 73.2 miles an hour, start-to-stop. In the summer, the seaside resort of Trouville-Deauville, 136.2 miles from Paris, is reached by rail-car in exactly two hours. Three steam-hauled expresses, between Rouen and Paris, cover the 86.6 miles in 83 minutes. The main line from Paris to Cherbourg has a total length of 230½ miles, passing through Mantes (thirty-six miles: the junction for the Rouen and Havre line), Bernay (ninety-nine miles), and Caen (148½ miles). On this line, and even on the short boat train route from Paris to Dieppe, sleeping accommodation of the Couchettes type is provided for passengers of all three classes. The State Railways were pioneers in the matter of providing sleeping-berths, even for third-class passengers, six narrow leather-padded bunks being fitted in each compartment. This was a welcome alternative to spending the night in an ordinary French third-class carriage of the period. Another important main line of the State Railways is that from Paris to Brest. For reasons of operating convenience, the Brest trains do not use the St. Lazare terminus at Paris, but the neighbouring Montparnasse Station. From Montparnasse to Le Mans is a distance of 131 miles, and in the course of the run the train passes through historic Versailles, only ten miles from Paris, and Chartres (fifty-five miles), with its superb cathedral. From Le Mans a line diverges which eventually splits up to serve Nantes and St. Nazaire, while a line of the Orleans Railway runs south to Tours. Another State line runs north to Alencon, beyond which it links up with the main State line to Granville. Going westward, Rennes is reached, 232½ miles from Paris, and here the Brest line crosses the north-to-south State line connecting the port of St. Malo with Nantes, and providing another through route from the Channel to the South of France. The line then bears roughly north-west into the ancient and beautiful land of Brittany, reaching St. Brieuc, some 295 miles from Paris. Brittany is to France what Cornwall is to England - a sunny peninsula peopled by an individual Celtic race, speaking a language of their own. Cornish is a dead language, but it was akin to the language of Brittany, and, for that matter, to Welsh. To-day, Brittany is far less Latinized than Cornwall has become Anglicized, and the visitor need not go far before he hears the lilting Breton tongue and the skirl of the Breton bag-pipes. A superb relic of the old Celtic religion may be seen in the stone avenue of Carnac, which may be contrasted with Stonehenge in Wiltshire. But it is a far call from the Druids to the “Etat”. THREE FRENCH RAILWAYS are indicated in this map. They are the State Railways, controlling 5,727 miles of standard gauge track, the Eastern Railway, with 3,189 miles, and the Alsace-Lorraine Railways, with 1,423 miles. This last total includes the lines of the company in France, Luxemburg and Switzerland. The system was returned to French administration after the war of 1914-1918, and has had an involved history. Brest is 387¾ miles from Paris; the best train leaves the capital at 3.25 in the afternoons and is in Brest three-quarters of an hour before midnight. This train runs from Paris to Le Mans without a stop, but beyond Rennes calls are made at a number of places, and the run entails several fast intermediate timings. The express rail-car provides an invaluable means of quick passenger transport over cross-country lines where the number of travellers is limited but fairly constant. The Western main line of the State Railways is also unique in France, and probably on the whole mainland of Europe, in that track water-troughs are provided to facilitate fast non-stop runs over long distances. Until May, 1933, the old Orleans lines to Quiberon and Quimper invaded the State Railways’ preserve of Brittany. In that month, however, the State took over the Orleans lines in question, together with locomotives and rolling stock for working them, thereby increasing their total route mileage to 5,965, including over 238 miles of metre-gauge lines. Though the State Railways have not yet adopted main-line electrification to the extent achieved by the Paris-Orleans-Midi, a considerable mileage of their suburban passenger lines in and around Paris is electrically operated. 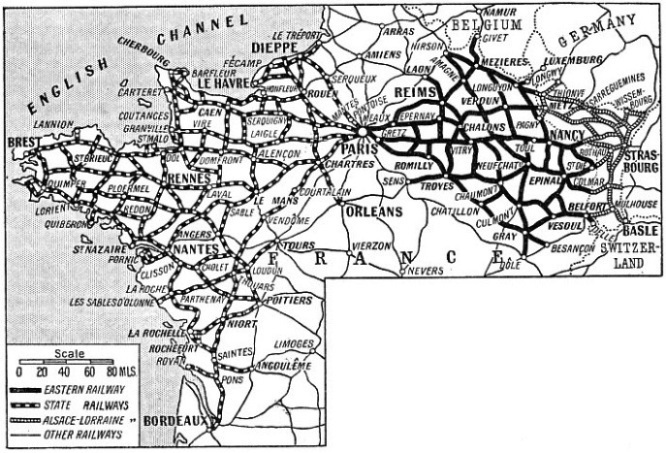 Moreover, the main line from Paris to Le Mans was scheduled in 1935 for electrification. Details of this main-line scheme will be found in the chapter “Electrification in Europe”, which begins on page 1121. As far back as 1900, a start was made with the line from Paris to Versailles, on the direct current system at 650 volts, third-rail contact being used. This line uses the Invalides Station, the State Railways’ third Paris terminus. Between 1924 and 1928, the same system was applied to the line from St. Lazare to Versailles, together with the branch to St. Germain. On other suburban lines, the “push-and-pull” system, familiar on British branch lines, has been developed to serve heavy business traffic, a practice now prevalent on other lines out of Paris as well. There is one long main line of the State Railways which has not yet been considered - that from Paris to Bordeaux via Thouars. This is considerably longer than the direct route of the Paris-Orleans Railway, and is thus of less significance. The distance from Paris (Montparnasse) to Bordeaux is 382 miles, that by the Orleans line being only 368. An important branch, however, extends from this State-owned Bordeaux line, providing through communication between Paris, La Rochelle, and Rochefort, on the west coast, eventually linking up with the Bordeaux line again at Saintes. In the early days, the locomotives used on the Rouen and Havre line were designed by Mr. Buddicom, who had worked with Alexander Allan in England. They resembled Allan “Crewe” locomotives, which were so familiar on the London and North Western and on certain of the Scottish railways in the early part of the Victorian era. One of the old Buddicom engines remained in service until well into the present century, and is now preserved as a relic. 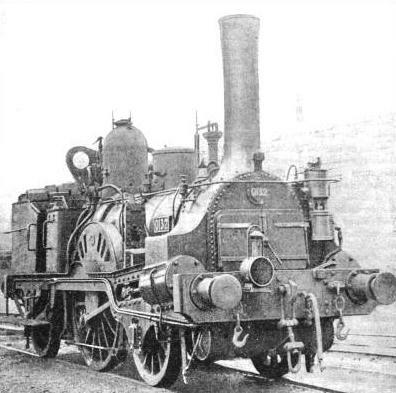 In the latter part of the nineteenth century, the Western locomotives resembled those of other French railways. A Webb compound was ordered from England and tested, but even in France, the land of the compound for so many years, the Webb engine was not appreciated. 4-6-0’s practically identical with the well-known “Castle” class of the old Highland Railway. The cabs and running plates were slightly wider; apart from this, the locomotives might have come straight off the Highland. Though fifty went to France, the Highland itself never possessed more than nineteen “Castle” class engines. AN EARLY “BUDDICOM” ENGINE used for many years on the Western Railway of France. The type closely resembles the “Crewe” design of Alexander Allan, the works manager of the Grand Junction Railway at Liverpool in 1840. The Western Railway of France was absorbed by the State system in 1908. Since 1928 great strides have been made in the modernization of the French State locomotive stock, and the standard express passenger locomotive of to-day is of the four-cylinder compound 4-8-2 type, similar to the class introduced some years before on the Eastern Railway of France. 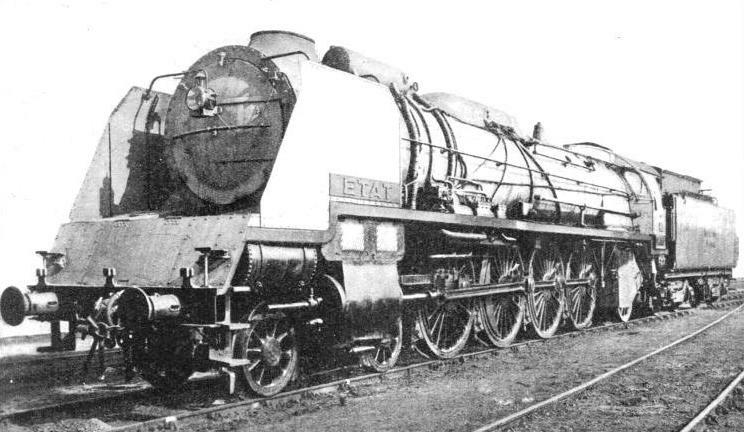 The big 2-8-2 tank locomotives used on the “push-and-pull” suburban trains similarly recall “Eastern” design. The trains each consist of nine coaches, the engine being permanently coupled at the Paris end. On the main lines, the eight-coupled locomotives are supplemented by large four-cylinder compound 4-6-2 engines, while at the beginning of 1933 a three-cylinder simple 4-8-2 with poppet valve-gear and a mechanical stoker made its appearance. Some of the old coaches of the State Railways were indifferent vehicles. On the most important Paris suburban trains, great use was made of the “Imperial” coach, which was a simple double-decker with stairs at either end. The lower deck contained ordinary second-class compartments with but little head-room. On the upper deck there were seats for third-class passengers, protected after a fashion by an awning, though open at the sides. A third-class journey through the Batignolles Tunnel on one of these coaches was not recommended. The double-deck system has remained in Paris, and is applied to some of the most modern suburban bogie coaches, but these are very different from the old “Imperials”. The present-day corridor coaches used on main-line services include some remarkably fine vehicles. Some of them are said to be the largest passenger coaches in Europe. On the boat expresses, instead of Pullmans, special saloon coaches are in operation, and these are not dissimilar to the special saloons on the British Great Western Railway. As we have seen, Couchettes (berths without bedclothes) provide the sleeping accommodation on the night trains to Le Havre and Dieppe. On the longer-distance night trains, such as those to Brest and Quimper in Brittany, the fully-fledged sleeping car is in evidence, as well as Couchettes and Lits-Toilettes compartments. These terms are explained in the chapter “Through Southern France”, which begins on page 1277. Some time ago an ingenious arrangement was evolved for giving lying-down accommodation on excursion trains without sacrificing any space. A third-class compartment seating the usual four passengers a side can be made to give sleeping berths of a simple type to all eight occupants. By day the four successive berths on either side are let down to rest one on top of the other, forming the day seat. Enormous progress has been made in the signalling and permanent way departments of the French State Railways. “Flyovers” have replaced old-fashioned and inconvenient level junctions at important points, and gravity marshalling yards have been laid out at Le Mans, at Trappes, near Versailles, and also outside Rouen. In the Paris suburban area, centralized traffic control has been brought into use on the system pioneered on the Metropolitan branch line to Stanmore in Great Britain. There are many other fascinating features of the modernized and rejuvenated French State Railways which could be described in a more specialized work, but now we must turn our eyes eastward, and deal with the two great systems which handle the traffic between France and Central Europe, namely the Eastern Railway and the Alsace-Lorraine Railways. Before the Franco-Prussian War of 1870-71 the principal lines in Alsace-Lorraine were owned and worked by the Eastern Railway of France. The year 1871 saw the transfer of Alsace and Lorraine to the German Empire, and the consequent loss by the Eastern Railway of its eastern extremities. When the much debated territory returned to French rule alter the war of 1914-1918, the railway system remained under a separate administration, instead of returning to the Eastern Railway. The Germans had added various new lines to the system since 1871, and when handed back it was really simpler to work as an autonomous concern. So the Eastern Railway of France still does not extend so far east as it once did, though it has been changed and extended in various other directions. The Eastern Railway of France suffered considerably from the devastation caused by the war of 1914-18. By the end of August, 1914, the first month of the war, the Germans had advanced into the valleys of the Marne and the Aisne, and had behind them the main line of the Eastern Railway through Château Thierry, Epernay, and Châlons. The Eastern main line was crossed by the fighting front at Meaux, no more than twenty-eight miles from Paris. The through line to Strasbourg emerged once more through the German front near Vitry-le-Francois, 127½ miles from Paris. After such an experience from the beginning of the war, it is not surprising that when the Germans evacuated France in 1918, much of the Eastern system was in a similar state to that of the ruined Belgian railways farther north. Gradually the system was rebuilt, but it was a long and expensive business. As with Belgium, much German rolling stock was transferred as reparations to the Eastern Railway of France after the war. AN OLD “CRAMPTON” LOCOMOTIVE of the type which formerly ran on the Eastern Railway of France. One of the last of these engines was in service until 1913. The Eastern Station, or Gare de l’Est, in Paris is an imposing building. Although the original style of architecture has been retained, the terminus has been almost entirely rebuilt during the last few years. The extension of the station has caused the doubling of the existing facade, and its new appearance is fine indeed. From the terminus the main line runs down the Marne Valley through Chalons, thence passing on to Nancy, 219 miles from Paris. Alsace-Lorraine territory is entered by the former German frontier station at Avricourt, but for practical purposes Strasbourg forms the finishing point of the initial Eastern run from Paris. The distance to Strasbourg is 312 miles. A vital branch leaves this line between Meaux and Château-Thierry, and strikes north through Reims and Sedan to Longwy and Luxemburg. At Reims, the Longwy branch is crossed by the through cross-country line from Chalons to Calais via the Northern Railway. This is described, together with the subsequent run through Avricourt and Strasbourg to the German frontier and beyond, in the chapter dealing with the “Orient Express”, beginning on page 369. The third great eastbound main line bears farther south than the two mentioned already, and runs through Troyes (104 miles from Paris), Chaumont (163 miles), and Vesoul (237 miles) to Belfort (275 miles). From Belfort it runs through the extreme south of Alsace to provide a link with Switzerland via Basle. This line brings Basle within 338 miles of Paris. Altogether, the Eastern Railway of France owns and operates about 3,189 miles of route, all built to the standard gauge. One of its best expresses is a morning train from Strasbourg to Paris, which runs non-stop from Nancy to Paris, 219 miles, in 216 minutes. A “DECAPOD”, or locomotive with ten-coupled driving wheels belonging to the Eastern Railway of France, and used for heavy freight and mineral traffic. In normal times an extensive iron-ore traffic is carried on the lines of the Eastern Railway from Briey, Longwy, and Nancy. While the State Railways serve agricultural districts, where the heaviest traffic is a seasonal movement of holiday-making passengers, the Eastern, on the other hand, serves the important industrial areas about Longwy and Nancy. Another difference between the two systems is caused by the heavy international passenger traffic carried over the Eastern lines to and from Germany and Switzerland. Except for the boat trains to Dieppe, Havre, and Cherbourg, the State Railways’ passenger traffic is to all intents and purposes national rather than international. The Eastern Railway provides a vital link between Paris and the cities of Central and Southern Germany, Austria, Czechoslovakia, Hungary, and the nations of Eastern Europe. Travellers from Paris to Munich, Vienna, Prague, Budapest, Bratislava, Sofia, Athens, Bucharest, and Istanbul may with advantage, and often inevitably, begin their journeys over the main lines of the Eastern Railway of France. The Gare de l’Est is veritably a gateway to the East, for beyond Istanbul, the “Taurus Express”, as explained in the chapter beginning on page 1521, runs through Asia Minor, and connects with services to Iraq and Palestine (for Egypt). AN ALSATIAN “PACIFIC”. Heavy 4-6-2 engines - of which the type illustrated is the most recent - are used by the Alsace-Lorraine Railways on the expresses running between Basle and the Belgian frontier. The system owns some 1,480 standard gauge locomotives. In the matter of locomotives and rolling stock, the Eastern, in spite of being completely disorganized in two major wars, has always kept abreast of the times, and compares favourably with other French railways. In the old days, the “Crampton” type of locomotive was popular, and these odd-looking machines, with their big driving wheels right “aft”, survived in places for a long time. There was at least one in service as recently as 1913, and a fine example has been preserved for its historic value. Before the war, large “Pacific” type locomotives were working the best passenger trains, while for heavy mineral traffic, an articulated “Mallet” compound class with the 0-6-0 + 0-6-0 wheel arrangement was introduced. Paris suburban trains were then operated by 4-6-4 tank locomotives generally similar, in dimensions, to the 4-6-0 locomotives used on secondary long-distance passenger trains and expresses of lighter weight. During the war, locomotive development was naturally at a standstill, seeing that the railway system itself was dismembered for a time. In 1925, however, the long series of four-cylinder compound “Mountain” type engines, which have since become so famous and which, as we have seen, the State Railways took as their own standard, began to make their appearance. On heavy suburban passenger traffic, too, the 2-8-2 tank engines, also popular with the State Railways, began to supersede the older 4-6-4 type. The immediate post-war years also brought an influx of German locomotives, mostly off the Prussian State Railways, to replace those of the Eastern which had been destroyed or damaged and worn-out by war service. Even before the war, the Eastern coaches and other rolling stock were good by French standards. Four-wheeled “double-deckers” were much used on suburban trains; but these were in every way superior to the “Imperials” of the Western Railway, being completely closed in and more modern in general design. The mainline stock compared well with that of Germany and of other Continental countries. To-day, modem all-steel coaches continue to appear in large numbers. Modern third-class compartments answer all reasonable demands for comfort. First- and second-class accommodation has been consistently good for years. International Sleeping Car stock is run on the long-distance trains to Germany and beyond. The third great French railway system which remains to be described is that of the Alsace-Lorraine, or A-L Company, having its headquarters at Strasbourg. As mentioned already, the older lines of the A-L once belonged to the Eastern Railway, which lost them after the Franco-Prussian War. On the return of Alsace-Lorraine to the French Republic, the railways were formed into a separate system, and as they had already made up a distinct division of the Imperial Prussian State Railways, no fundamental changes were necessary. In Alsace, a straight main line runs down parallel to the Rhine from Strasbourg to Basle, a distance of eighty-eight miles, passing through Colmar, Bollwiller, and Mulhouse. Mulhouse, over sixty-seven miles south of Strasbourg, is a notable junction, and from it there runs an important line to Belfort, giving through communication with the south of France via Lyons and the PLM. North of Strasbourg, the central trunk line runs up through Sarrebourg and Metz to Thionville (Diedenhofen), eventually reaching Luxemburg, 137 miles from Strasbourg, The border between Alsace and Lorraine is crossed between Saverne and Sarrebourg. The total length of route on the A-L, excluding lines in the former Saar Plebiscite Area, amounts to 1,423 miles, of which over 128 miles are in Luxemburg and three miles are in Switzerland. In the Saar, the A-L Company was allotted nearly twenty-two miles of line. ON THE EASTERN RAILWAY OF FRANCE. In 1925 “Mountain” type locomotives - one of which is seen above - were introduced on the Eastern lines, and were at the time among the most powerful in Europe. The design was later adopted as standard by the French State Railways for their express services. You can read more on “A Link With the Mediterranean”, “The Northern Railway of France” and “Through Southern France” on this website.